Coral reefs around the world are heavily threatened by human activity and climate change. A recent survey by World Resources Institute found that up to 75% of coral reefs are at risk. This puts the countries that rely on its thriving ecosystems in peril. Impacts include rising ocean temperatures, pollution from coastal development and over-fishing. Coral produces a ‘stress signal’ when these environmental changes occur which causes the coral to ‘bleach’ when warmer waters are observed which seriously harms the coral. There are many initiatives to preserve coral reefs and maintain these beautiful ecosystems. In Thailand, Oyster run a diving and marine conservation project near Koh Phangan where volunteers work alongside a research organisation. You help promote the survival of the coral and fish, gather data and implement clean-up programs. Volunteers gain their PADI open-water certificate and contribute with this very hands-on project. 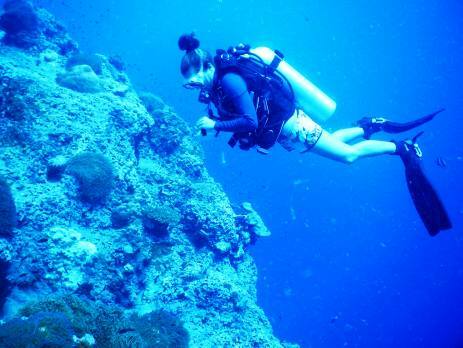 You get to personally see the efforts made first-hand towards the survival of the coral reef. Another location where the coral reef has been badly affected recently is in Mexico. The Cancun-Isla Mujeres Marine Park between the city of Cancun and the island Isla Mujeres is one of the busiest waterways in the world. 750,000 people visit the stretch of water each year which has put pressure on the health of the coral through over-tourism, anchors and pollution. Recently, Iain at Oyster visited this area of Mexico and discovered an innovative and compelling scheme to promote the coral and fish life in the marine park. The Cancun Underwater Museum or MUSA was created in 2010 by British sculptor Jason deCaires Taylor and consists of over 500 life-sized sculptures placed on the sea-bed. The intriguing piece has human figures, houses, cars and animals as sculptures. The material used to make these sculptures is marine-grade pH-neutral cement. The material used ensures no harm to the environment and is used to promote coral, seaweed and algae life. As a result, the sculptures, which have been placed away from the natural coral, aim to encourage sea-life and coral to thrive in a new location. Bringing together art as a form of conservation is a highly remarkable venture and one which has succeeded. Taylor has created these sculptures in the Bahamas, Canary Islands and Grenada too and looks to work out in the Middle East and Australia. His work highlights the way that humans have neglected environmental concerns in the past and how uninvolved some people are with their surroundings. Since 2010 the sculptures have slowly become over-run with sea-life and coral. 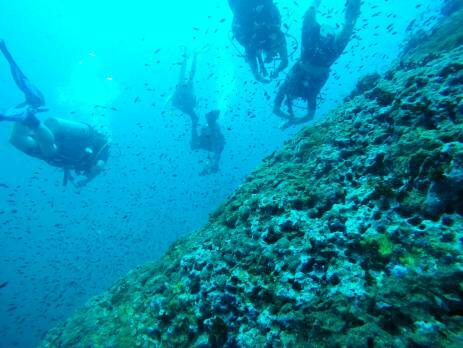 The stable structures of the statues are an ideal base for artificial reefs; similar to how underwater shipwrecks are abundant with sea-life. The sculptures also have holes within them which fish and other marine life can live in and feed off the coral. Therefore, as coral life increases, marine life will also grow. In a number of years, the statues will be over-run with coral and eroded down until they are barely visible. A visual reminder for how humans can destroy coral life; the coral can do the same vice versa. Furthermore, the museum naturally attracts tourists and informs them of coral conservation. The museum appeals to budding scuba divers, snorkelers and environmental activists alike. The museum has brought the message of coral and marine conservation to the public’s attention through this museum. It isn’t all doom and gloom with coral reefs. They are resilient organisms and have been known to ‘bounce back’ from extreme damage. Problems like coral bleaching is threatening, however, with conservationist aiding, the coral population is being helped to rejuvenate. If you would like to take part in a truly inspiring and astonishing conservation experience with Oyster, we have a booking form you can fill out to join our marine and diving conservation programme in Thailand.